Thai food is Kristina’s favorite, and it’s right up there in my favorites as well. Unfortunately a few years ago we moved from an area that had great Thai restaurants on just about very corner to a place where the Thai places are few and far between. So I’ve tried to come up with a pretty good approximation, although I’m far from a real authentic Thai chef. A couple ingredients that often go in an authentic Thai red curry, like kaffir lime leaf and lemongrass, you probably won’t find unless you visit an Asian grocery. So I use lime juice, which makes a good substitute for the citrus flavors of the lime leaf and lemongrass. If you have an Asian grocery nearby and want to get the special ingredients, great, but if that’s not an option, the ingredients I use here are all what can typically be found in your average grocery store. I’m adding this one to the “Quick Meals” category, but with one caveat- this is a two-step process. The first step is making the coconut milk/chicken stock for the curry, which takes time, but can be frozen in portions for next time. When it’s next time and when you have some of that curry base, you can whip up a new batch of red curry fast. Here’s the part that eluded me when I first tried to make a red curry that tasted like what we’d get in our favorite Thai restaurant- the coconut milk flavor would be too obvious in the curry and drown the other flavors out, no matter how I adjusted the mix. The secret is to simmer the coconut/chicken stock mix for a long time. Take enough bone-in chicken pieces to cover the bottom of a large pot. Season with a little salt and pepper, leaving the skin on. Heat up a couple tablespoons of peanut oil in the pot and brown the chicken pieces on each side. Remove them when they’re nicely browned and pour off the leftover fat. Now add the chicken stock, a little at first, and scrape up the browned bits on the bottom of the pan. Add the rest of the chicken stock and coconut milk, mix it up good, and add the chicken pieces back in- they should be covered in the stock/coconut milk. Note: I use 1 can regular and 1 can light coconut milk because the regular is really high in saturated fat, but 2 cans of the light is too thin and doesn’t give the curry enough richness. One of each is a good compromise, I think. Simmer with the top on at low heat for about two hours. Take out the chicken pieces and separate the meat from the skin and bone- the meat should fall right off the bone. Shred the chicken and save it for step 2. Reserve enough of the curry base- 1-2 cups worth- and freeze the rest into portions for next time after it cools. If you’re using frozen red curry base that you saved, cut raw chicken into strips. If you just did step one and you have shredded chicken, you just have the veggies to concern yourself with. Cut the green onion into 1/2 inch pieces. Dice up garlic and ginger. Cut pepper and eggplant into thin strips. 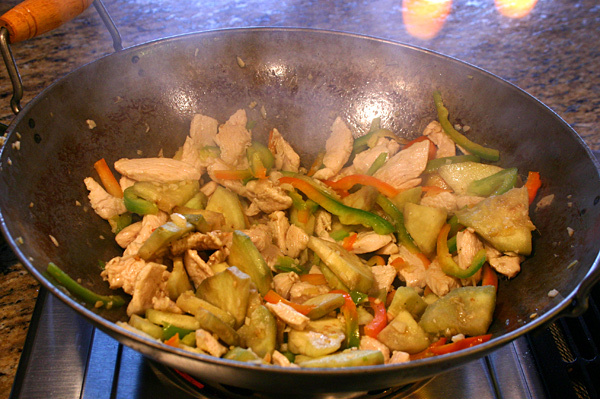 We’re going to cook fast and hot, so we want the veggies to be very thin so the stir-fry only lasts a few minutes. Depending on how spicy you like your Thai food, add in some finely diced hot chile pepper too. Now let’s get the red curry sauce ready. Take a cup or two of the chicken stock/coconut milk base we made in step one. Mix in the red curry paste, fish sauce, and lime juice. Add red chile powder, again depending on how spicy you like it. Now pour a tablespoon or two of peanut oil into the wok and let it heat up (peanut oil is best because it holds up well to high heat). 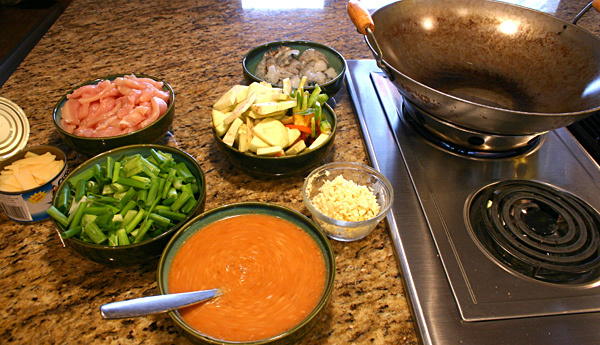 Get the ingredients all ready by the wok, because things will happen fast now. When the wok is good and hot, throw the diced garlic and ginger into the oil and mix around just for a few seconds, long enough to flavor the oil but not long enough to brown the garlic/ginger. Throw the chicken in (if you don’t have cooked shredded chicken from step one) and constantly stir the chicken until it’s just browned on the outside. Throw in the peppers and eggplant and keep stirring. After a few minutes of cooking the first wave of veggies, throw in the green onions. They cook fast so you don’t want to add them the same time as the other veggies. Add the shrimp around the same time as the onion if you want to. 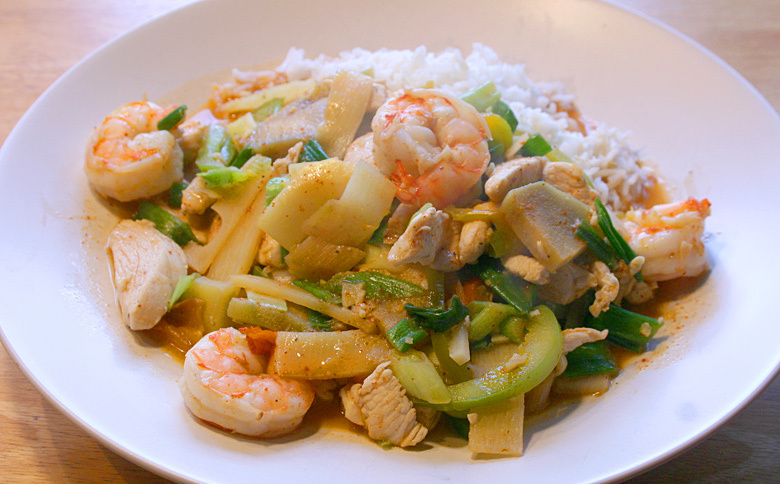 I like a mix of shrimp and chicken in my Thai- it gives a nice mix of texture and flavor to the meal. toward the very end add the bamboo shoots (and the shredded cooked chicken from step one, if you’re going this route). Don’t overcook the vegetables– the peppers should still have a little crispiness. Chop up some cilantro and garnish on top if you like. Add onto cooked rice and enjoy! I’m sitting at kristina’s fav Thai resta & reading this! Many good memories….how nice that mike is making this for her. Sounds delicious. What a great husband!